The Ardèche surrounds the Ardèche River in south central France, and is known for its spectacular gorges and karst features - some of its caves were inhabited by prehistoric humans - and peaceful, rural atmosphere. Choosing the best places to stay in the Ardèche really depends why you’re coming to this region, but our Guru’s collection of recommended properties includes great options for foodies, sight-seeing and for people looking for a rural escape. To really see the Ardèche you probably need access to your own car. The river winds between towering limestone cliffs creating the magical gorges with their surprising colour and dramatic views, and you’ll need a car to se the most spectacular sights - like the naturally created bridge, the Pont d’Arc. There are also a number of very beautiful château in the region, and Mont Gerbier de Jonc, a volcanic mountain with three springs at its base, one of which is the source of the Loire river. Just remember that the region is a hugely popular spot during July and August. So if you want to ensure a bed in one of the best places to stay in the Ardeche in the summer months, get organised and book well ahead. Otherwise come when it's quieter and you can enjoy the views without the crowds. The Château de Rochessauve is a wonderful family château with charming, traditional interiors and three rooms adorned with rich fabrics, antique furniture and paintings. There’s also a lovely pool and terraces. 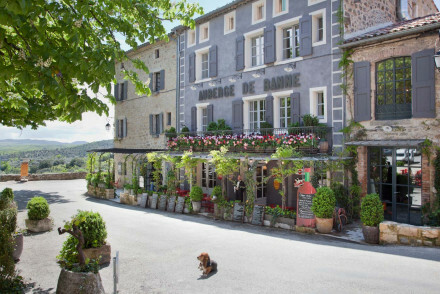 The Auberge de Banne in Banne, in the Ardèche, is a beautiful property with an award-winning restaurant in a quaint village. There are just 11 rooms with plenty of luxurious features and a lovely outdoor pool. You’re within the Cévennes National Park. The Domaine de Chalveches in the Ardèche is a chic, modern property with beautiful mountain views. Each of the ten rooms and suites are individually designed, but with nature in mind, and there’s a spoiling spa. Château de Balazuc is a historic château with plenty of original features - like chain mail drapes, stone steps and rampart rooms. But the four rooms offer a comfortable blend of antique and modern fixtures and fittings, and you’re just ten minutes from the famous gorges of the Ardèche and Vallon Pont d'Arc. 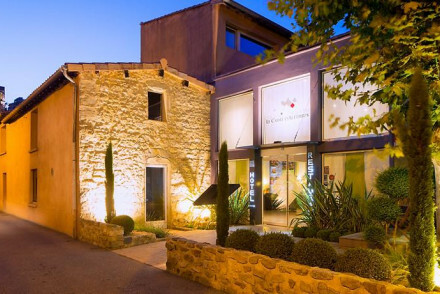 The Hotel de la Villeon in Tournon-sur-Rhône is a beautifully renovated property a pretty village in an unspoilt corner of France. The rooms are large, light and elegant and there are pretty gardens. The Château Clément is a wonderfully period French château with just five individually decorated rooms and light, airy interiors. There’s also a heated outdoor pool and an indoor pool in the spa - and the food is great, even offering onsite patisserie classes. 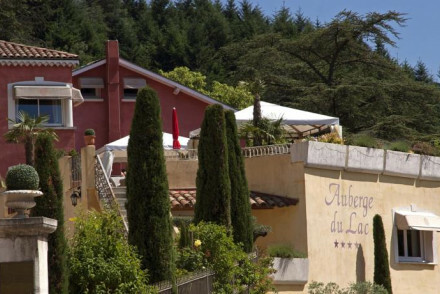 The Auberge du Lac is an elegant four star property in a gorgeous lakeside setting, with 12 generously proportioned rooms, a lovely infinity pool and an acclaimed restaurant serving modern French food. Great value, with rooms starting from around £70 per night, and great for families. The Hotel Helvie in the spa resort town of Vals-les-Bains is an elegant, 27 room hotel with floor to ceiling windows and traditional furniture. Regional cuisine is served in the restaurant, there’s a nice pool and it’s very reasonable. With spacious, comfortable rooms, Le Carre d'Alethius is a stunning Michelin starred restaurant with rooms just 10km south of Valence. Its design features are contemporary as seen in the restaurant which specialises in innovative cuisine. A must for foodies with excellent value accommodation. Value chic - Double rooms start from as little as €90 per night. 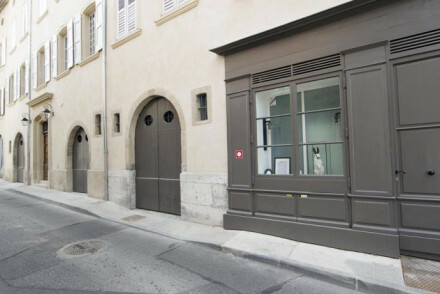 Local markets - Browse the local markets of Charmes-sur-Rhone and pick up some regional produce. An elegant 4 star property with gorgeous lake setting. Simple rooms are generously proportioned and decorated in natural hues. A lovely infinity pool and acclaimed restaurant serving modern French cuisine. All this plus plenty of activities in the surrounding area makes this ideal for families. Families - Plenty of activities in the surrounding area to keep all entertained. Foodies - Modern french cuisine with stunning lake views as a backdrop. 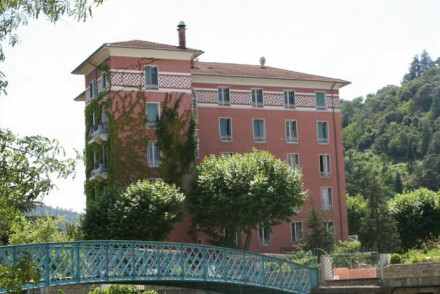 An elegant property in the charming spa resort town of Vals-les-Bains. Large rooms with floor to ceiling windows and traditional furniture. A lovely outdoor pool plus delicious regional cuisine is served in the restaurant. An abundance of activities in the area. Ideal for business or families. Value chic - An elegant hotel at very reasonable rates. 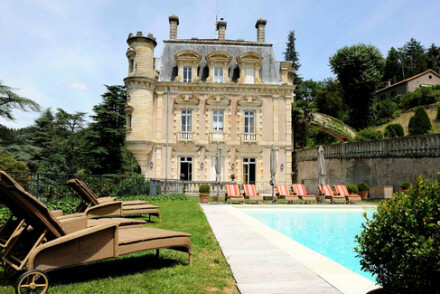 A gloriously unspoilt family chateau nestled into a hill. Charming, traditional interiors include beautiful bedrooms with rich fabrics, antique furnishings, and paintings. Lovely pool, terraces, and vegetable garden to pick from for lunch. Ideal for complete peace and quiet away from the crowds. Total relaxation - A spot to really unwind; laze on the terraces, swim in the pool, read a book in the garden, or pick some vegetables. Views - Stunning views over the Alpine range. Traditional - A traditional family home with a charming owner. A glorious property in a quaint village. Excellent design mixes the old with the new. Rooms feature crisp white linens, large glass-fronted walls and luxury bathrooms. Boastings a lovely outdoor pool and an atmospheric, award winning, restaurant. The perfect French rural escape. Foodies - A stunning restaurant, recognised by the Michelin Guide, serving regional cuisine. Country Escape - Situated in a quaint village within the Cévennes National Park. Great walks - Stunning walks in the surrounding National Park. Sights nearby - Visit the beautiful Banne Castle. This historic Chateau has been renovated and restored many times but has never lost its traditional charm. With chain-mail drapes, original stone steps and a room in the ramparts, the accommodation offers a fabulous combination of ancient and modern. A stylish haunt in the heart of the Ardeche. 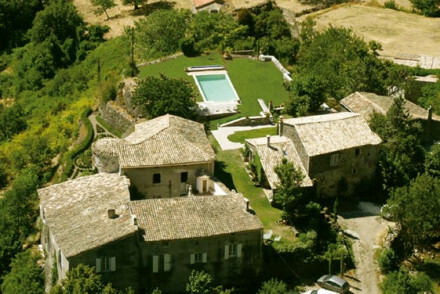 Sights nearby - 10 miles from Vallon Pont d'Arc, the famous gorges of the Ardèche and the "Caverne du Pont d'Arc"
Swimming Pool - 43 foot long outdoor swimming "corridor"
A painstakingly and beautifully renovated property in the pretty village of Tournon-sur-Rhône. Large light rooms with enormous beds and elegant design. Converted stables are home to contemporary breakfast and seminar rooms. Pretty gardens. A great choice for local exploring and business meetings. Local exploring - A lovely and unspoilt corner of France with plenty of cultural and outdoor activities. A beautiful, quintessentially French, period guest house welcomes you into its light and airy interiors. Bedrooms are individually furnished with a clever mix of contemporary and antique. 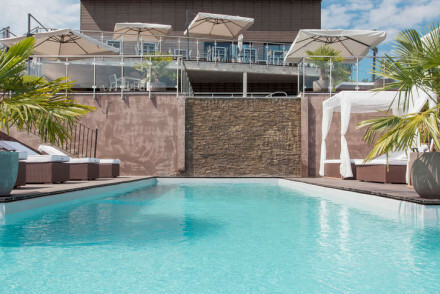 Come for spa relaxation, chilling by the pool and great French food - enjoyed with the hosts. Cooking classes - Pierre offers Patisserie classes on site. Modern chic with mountain views. Contemporary rooms, each individually designed, are light and fresh with tones of the surrounding nature found in the wood panelling or exposed stone. Suites feature in room hot tubs. A completely spoiling spa and abundance of outdoor pursuits. Country bliss. Spa breaks - A fabulous spa with cabin treatment rooms and using the completely natural Ymalia products. Country Escape - Mountain views and a host of outdoor pursuits in the surrounding area. Great walks - Wander through the surrounding vineyards. Private Hot Tub - In the suites.